Two(2) Queen size beds, One (1) Double beds, Living Area, Mini Kitchen, Mini Ref., Dining Table, 19” LCD TV with cable, Private bathroom with hot and cold shower and bathtub, Telephone, DVD Player with 5.1 speaker, individual air-con and internet access. One (1) Queen size beds, Coffee Table, Private bathroom with hot and cold shower and bathtub, 19” LCD TV with cable, Telephone, DVD Player with 5.1 speaker, individual air-con and internet access. One (1) Queen size beds, Coffee Table, Private bathroom with hot and cold shower, 19” LCD TV with cable, Telephone, DVD Player with 5.1 speaker, individual air-con and internet access. Three (3) Single size beds, 21” CRT TV with cable, Private bathroom with hot and cold shower, Telephone, Pipe-in-music, individual aircon. Two (2) Single size beds, 21” CRT TV with cable, Private bathroom with hot and cold shower, Telephone, Pipe-in-music, individual aircon. One (1) Double size bed, 21” CRT TV with cable, Private bathroom with hot and cold shower, Telephone, Pipe-in-music, individual aircon. Two (2) Queen size beds, 21” CRT TV with cable, Private bathroom with hot and cold shower, Telephone, Pipe-in-music, individual aircon. - Check-out time is 12 noon. Early check-in/ late check-out is upon request, subject to corresponding charge. 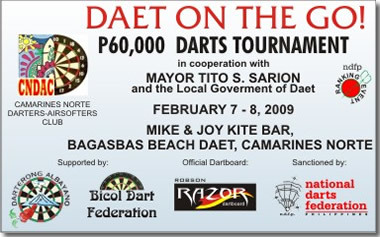 copyright 2005 - 2009www.ndfpdarts.com All Rights Reserved.